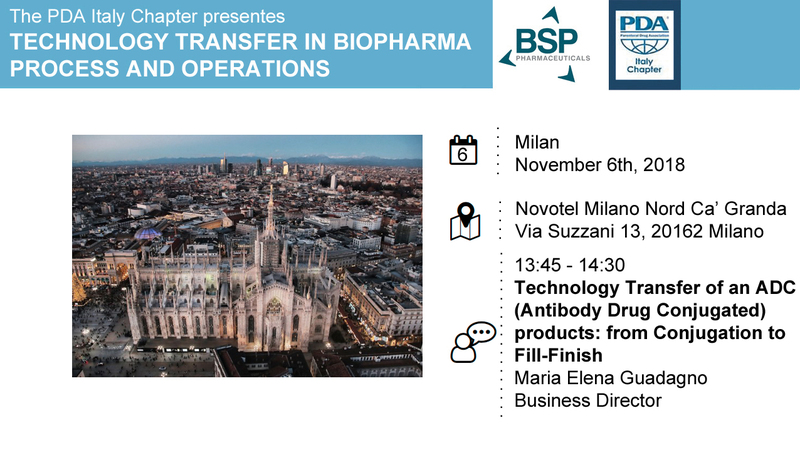 BSP Pharmaceuticals S.p.A. is proud to announce Its participation to the Technology Transfer in Biopharma Process and Operation at Milan, next 6th of November 2018 organized by The PDA Italy Chapter. Save the Date!!! Next November 6, 2018 from 13:45 to 14:30, Maria Elena Guadagno – Business Director of BSP – will presents the speech ‘Technology Transfer of an ADC (Antibody Drug Conjugated) products: from Conjugation to Fill-Finish’.